Don’t let your garage be a wasteland of junk and treasures. It’s very common, especially in America, for us to use our garages as a home to our stockpiles of stuff we have nowhere else to store in the house. Sure, there is absolutely nothing wrong with that but, surprisingly there are certain items that shouldn’t be kept in there for long periods of time. 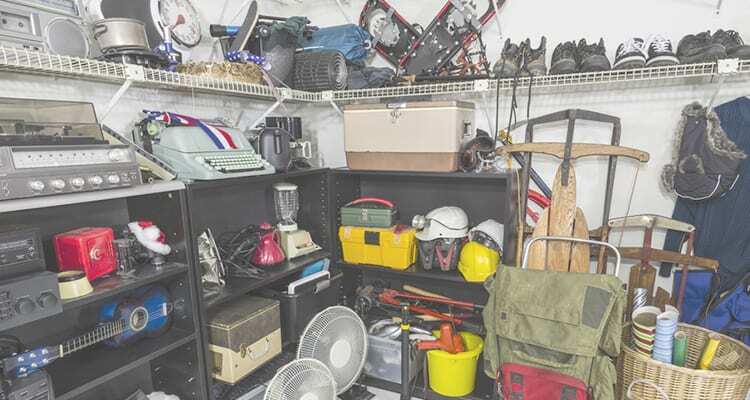 Check out this list of eight common items that have no business to be hanging out in your garage. Are These Items in Your Garage? Unless your fridge or freezer is made specifically for outdoor purposes, they don’t belong in your garage. Refrigerators belong in a climate-controlled location because when they’re exposed to extreme heat or cold, they work overtime to keep whatever it contains at the right temperature, therefore, this appliance won’t work effectively. In addition to your higher electric bill, your fridge could also increase moisture levels in your garage and could lead to molding. If you hold treasured photos and important documents, why keep them in the garage? Because temperature conditions in garages change fluctuate, paper and cardboard doesn’t respond very well to this as they will curl, stick together, dry out, and even might distort the images. Along with diminishing their longevity, they also pose as a fire hazard and make great nests for pests to settle in. Though you might think canned food will last a really long time, it won’t in a garage. High temperatures in a garage will spoil foods quicker and low, colder temperatures will freeze the food and then thaw out when warm again, which becomes inedible overtime. If you absolutely need to buy your food in bulk, try another storage option like cabinets or cupboards. Anything with a fabric material shouldn’t be stored in a garage either. This includes linens and blankets, sleeping bags, clothing keepsakes, seasonal clothing, and even furniture like sofas and chair cushions. If you keep cars and other vehicles in your garage, the fumes and chemicals can take a dangerous toll on fabric items, especially if you’re looking to use them at a later time. Pests also favor these items to build homes in as well. Try using vacuum-sealed bags or acid-free storage containers! It’s important to know that propane tanks are high combustible and needs to be properly stored because of the dangerous fire hazard it can cause, even if the tank’s valve is shut off. Keep in mind, they could also ignite when coming in contact with a parked vehicle or a sparks from a grinding tool being used in the garage workshop. Instead, keep your propane tanks in a ventilated space away from your home and make sure they are stored on a flat surface. Not only is firewood a magnet to insects and rodents, but their lifespan is cut short because of the extreme temperatures they’re exposed to. Firewood can dry out faster, therefore, won’t work properly when being used. It’s common to keep leftover paint and cleaning products sitting in the garage, but it poses as an extreme fire hazard when in an area with running gas. Because these products contain chemicals that easily ignite, it could cause a fire to spread faster when anything gets caught onto flames. Look up locations in your areas where you can properly dispose your paint and hazardous waste. Candles, wine, glass, leather, metal, and plastic items should not be stored in your garage. These items won’t last long and won’t hold its shape and quality as they should. Especially electronics, they can get damaged from the ever-changing condensation, humidity, and extreme temperatures.